The morning comes too fast. This may never go away. This pain may forever stay. Why pain? What value is this curse? Is God indeed in charge of all? Who thinks of God when all consumed? but pain’s shrieking, searing taste of death! Resigned I lay down to face the end. My voice unheard over pain’s noise! Background:This poem was written during a time of great pain and despair. I had debilitating back pain that was getting worse and worse over time. I could not sit down without sharp searing pain, yet every position and posture was painful. It was so strong no pain medications could touch it, I was just forced to suffer… praying to God daily that it might improve. Eventually it did. My heart goes out to all chronic pain sufferers! I felt punished by my pain, as I am sure many others do. I have come to believe this pain was a gift, one of which I write about in a (much later) blog post. 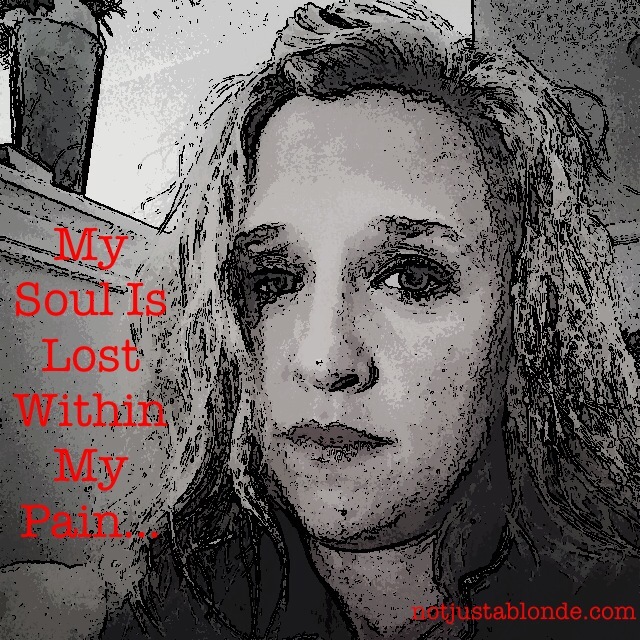 I was challenged spiritually by my pain and I was also humbled by it. I hated it but as in all of life’s trials I am a better women for it. I thank God for the lessons learned and pray for all those who still suffer with chronic pain to find healing and hope again. ❤️Love that! I will meditate on that tonight!❤️Thank you! This has a parallel to something that God has had me think about a lot, which is that when we are in spiritual discomfort it is probably because we are striving against God in some way, and so inflicting the discomfort upon ourselves. However, pain coming from a disease is a different matter, since the disease would not, in most cases, be a result of our actions. That would then lead to a debate about healing. On one memorable occasion, a young woman in the office next to mine (she was a believer in Jesus) began screaming in pain. It turned out that she suffered from endometriosis, and managed to tell me this while the on-site emergency team was on its way. Once they arrived, I went back to my office and a minute or two later she started to scream again. I prayed, begging God to take her pain away; a short while afterwards she stopped screaming, and it turned out that she had been given a pain-killing injection! A few weeks later she arranged to have a hysterectomy; her logic was that her womb was causing her offense (as in ‘if your eye offends you pluck it out’). Hi, Chas. It’s easy to think of pain as an enemy, but I try to think of it as a helpful sign I need to find ways to be more in harmony with the God-nature within. Bob, I agree 100% about the correlation between spiritual pain and deviation off of the path of peace and love as God intends for us. I have so many thoughts on this idea it will likely inspire another post for another day! Thank you for your insights! I believe this to be true! Chas, thank you for this comment! I can relate to your coworker so much! I am currently suffering with severe episodes of back/hip pain! I work in Orthopaedic Outpatient Therapy with Physical Therapists that specialize in back dysfunction. Although I had been doing stretches and stabilizing exercises as they recommended my pain over time was becoming worse! I asked one of the most experienced PT’s what she thought of chiropractic care as I was growing impatient and frustrated in my pains increase! She was hesitant to recommend I go to see one as she feared he might be “too aggressive”. but this thrilled me! You see, I wanted someone to aggressively address my pain! I felt like I was at war and my back pain was winning! I have seen the “aggressive” chiropractor now over a half a dozen times in the past week or so and he has given me relief and hope! I do believe I would do whatever it took to not feel pain like I’ve been experiencing over the past several weeks… it is so immobilizing and all-consuming!!! I was prayed over after church on Sunday. This was a special event you see as I attend a Methodist Church without an alter call. I was asked if I would like to be prayed over.. desperate and in significant pain I said YES! The next day my pain left me and has not been as severe since. Prayer helped me! Yes, I went to the chiropractor the next day… so he played a part in my healing as well… it was during that adjustment I felt a significant shift in my lower back. Answer to prayer? Yes! But what about those that pray and do not get relief? What of those poor souls that suffer in silence everyday?! I’ve got an intense empathy for them… and understand their suffering in a way I could never have before this horrific ordeal.